Okay, so now that the Truck Loan is behind me (save for tying up those loose ends) I can now turn my attention to the next great challenge . . . the Wanda Loan. As it stands now, the outstanding balance for Wanda is $34,558.75. How do I know this so accurately? Well the bank that I deal with (my main bank) and the one that the Wanda Loan is with allows me to see what that outstanding balance is on the handy-dandy banking app that I have for my iPad. This then got me to thinking, I can see what that balance is just before and then just after a payment is made. 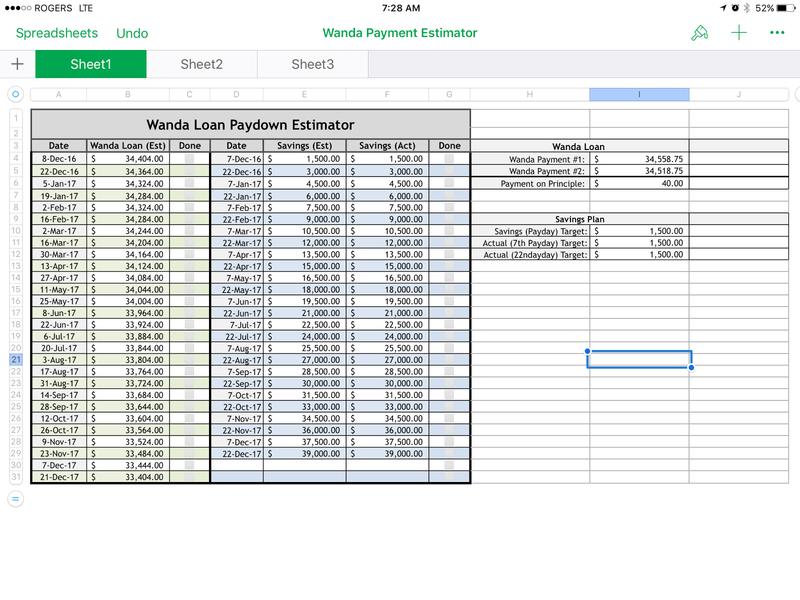 With this information and, you guessed it, another spreadsheet, I can make a tool that will let me estimate what that outstanding loan balance will be over time. At the same time with that same tool, I can not only predict my savings but measure my progress, see if I am on target and also figure out what I will have to save each payday in order to get back on track. 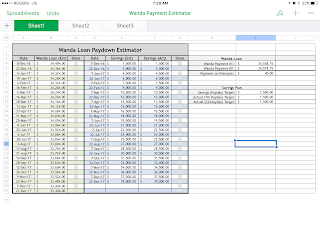 So, here it is, the Wanda Payment Estimator! On the left side is the status of the Wanda Loan and what it should be after each consecutive payment. How this is derived is by the simple subtraction in the box on the extreme right. The previous payment (as entered here) is subtracted from the current payment (as entered here) and the difference is the amount that my principle dropped. That amount is then used for the projections. Each time a payment is made I will check the balance from my banking app and enter it for the appropriate date entry. I could then also put those payment numbers into the formula on the right to see if the actual amount has fluctuated any. This way the further I go down this side, the more accurate my predictions will become, for they will further and further be based on actual numbers. The savings side has each of my paydays for the next year or so outlined. On the left column of this side is the target, as in that $1500.00 per payday that I am hoping to put aside. On the right column is the actual side where I will put in my actual balance of my Long Term Savings each and every payday. This side is also full of projections, yet they are based on different projections for my two different paydays. The first and second payday of the month has different things coming out of them, so I may be able to put a little more out of the second payday than the first. This way I can see how my actual savings plan is going and forecast when my savings will overtake that ever decreasing Wanda Loan Balance (at which point I can actually pay the Wanda Loan off all at once). The column of check boxes is there for me to tick off that a certain payment or payday has happened. This lets me know where exactly I am in this wall of numbers. If you can use this to help predict a savings plan to eliminate a certain debt, by all means, feel free to download and use it. I will add this to the downloadable tools on the side of this blog, if you change your mind.